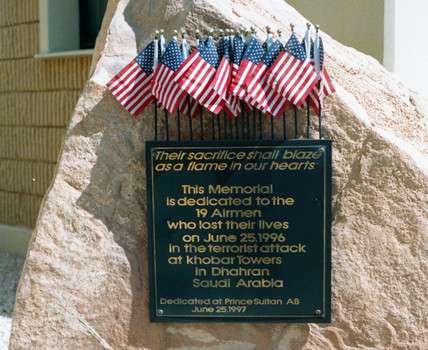 On June 25, 1996 a truck containing an estimated 5,000-pound bomb drove to the northern perimeter of the Khobar Towers near the city of Dhahran, Saudi Arabia and was detonated, killing 19 members of the 4404th Wing of the United States Air Force and wounding 498 others. The attack, which had been predicted by the State Department and DIA, ultimately proved to be a turning point for U.S. security posture worldwide. The Khobar Towers were built by in 1979 by the Saudis, though they remained unoccupied until the Gulf War in 1990. The facility served as Army Forces Central Command – Saudi Arabia (ARCENT-SA) in 1992 as a task force headquarters along with logistical responsibilities for contingency operations. In November 1995, a car bomb in Riyadh triggered a chain of events to heighten security measures for all military compounds in Saudi Arabia. 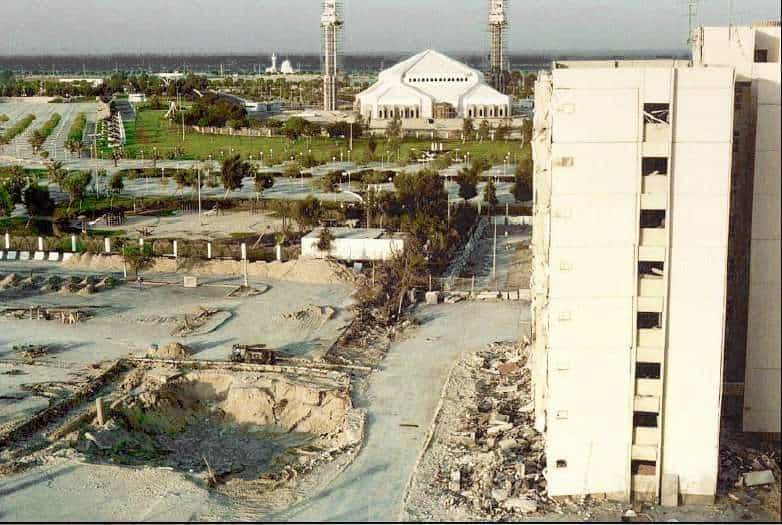 Vulnerability assessments of Khobar Towers made by the Air Force Office of Special Investigations in 1995 and 1996 prior to the June attack concluded that personnel should be less concentrated in the facility and shatter-resistant glass be installed in all windows. Despite precautionary measures, the sheer size of the truck bomb caused massive damage. Investigations pointed to the involvement of Iran or Hezbollah (which had strong support from Iran) in the attack. A complicating factor, however, was that Iran at the time was in the midst of a reformist movement, which led many in Washington to see a potential opportunity for the United States to improve bilateral relations with Tehran. Sunni Saudis, which for years had a problematic relationship with Shia Iran, preferred to downplay any involvement by Iran. The State Department found itself shut out of the investigation by the NSC, as its access to all raw intelligence files that even mentioned Khobar Towers was sharply restricted. Wayne White, who at the time worked for the State Department’s Bureau of Intelligence and Research (INR), describes the days leading up to the bombing and the astute work of one new Foreign Service Officer, Joe Fishbein, in uncovering the planned attack. He then discusses Iran and the measures that the NSC took to restrict the investigation at a time “some senior Clinton Administration officials did not want any new trouble with Iran.” Albert Thibault, Jr., who served in Riyadh from 1995-2000, first as Political Counselor, then as Deputy Chief of Mission, takes a softer stance, stating that, in his view, there was not “conclusive, absolutely dead-sure kind of evidence that the Iranians were involved.” He notes the Saudis’ ambivalence to incriminate the Iranians and how the attack proved to be a turning point in U.S. security posture. White and Thibault were both interviewed by Charles Stuart Kennedy beginning in April 2005. Go here to read about the devastating attack on Embassy Nairobi. WHITE: Rarely in the world of terrorism, because these matters are so covert and carefully planned, do you get specific information that something is going to happen and when. You rarely get enough before the fact and in time to do something about it. I was working away in my office back in 1996 a couple of weeks before the Khobar Towers bombing, and my Arabian Peninsula analyst came in to see me carrying some reports. 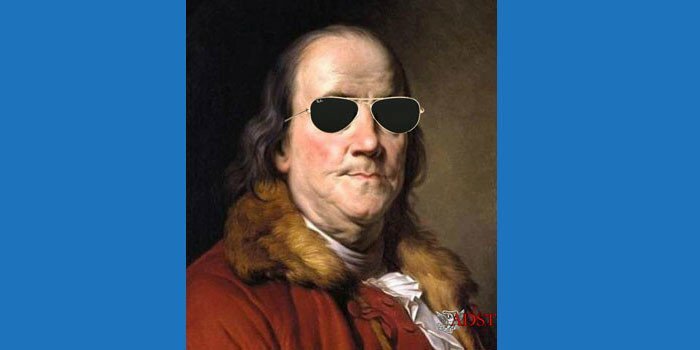 He was a Foreign Service Officer doing only a one-year tour in our office, and with little or no prior experience in intelligence, but very, very diligent. He said: “I think there is going to be a bombing. Someone is probably going to hit Khobar Towers. The indicators are pretty clear. I think we need to write something on it in the SMS,” which, as I said before, gets distributed around the intelligence community, to the Secretary, other Cabinet departments, the NSC, military commands, etc. So the next morning, 13 days, I believe, before the Khobar Towers bombing, INR issued a warning that it was probably going to happen. DIA, the Defense Intelligence Agency, picked up on our analysis very quickly. They ran their own warning, perhaps 10 days prior to the bombing. Some measures were taken by the people on the scene, but not nearly enough to deal with a bombing of that magnitude. That truck may have been the largest bomb that anyone had ever produced for such a mission up to that time. Virtually none of the bombings in Iraq have matched the sheer power of that truck bomb. Q: They are mostly car bombs. WHITE: There have been both, with a truck bomb having taken out the UN headquarters in Baghdad back in August 2003, but this was an entire fuel truck with detonating explosives. The massive load of fuel comprised its main explosive power. It was just devastating. But we called it. It was an incredible call. You get into situations where there is just so much intelligence that people have to sift through that you can easily sift through it, see the reports one by one, arriving during a span of days or weeks, and not put them together in one package. In addition, much intelligence can be insufficiently specific or from sources not highly regarded. In fact I think the other report that was really stunning to us was somebody supposedly accidentally losing control of his car and actually ramming into one of the security barriers there. Someone else might have chalked it up as an accident, but with the other reports in hand, it appeared to us as an attempt to test the strength of the security barriers for possible penetration by a car or truck bomber. Even the Khobar Towers people, their own security people, reported that they weren’t entirely buying the story that this guy just lost control of his car. I think he might have had some other connections that were a little suspicious. So, anyhow, all this came together, and very quickly, meaning that it seemed imminent, that they were close to attempting an actual attack of some sort, and we had pulled together what is called actionable intelligence in advance of the attack…. There was pretty good evidence that although the Iranians might not have been directly behind Khobar Towers back in 1996, Iranian-backed Hezbollah elements on the Arabian Peninsula were. So there apparently was some sort of Iranian connection to the bombing. Our failure to act doubtless related to political developments inside Iran. It was around the time of the reform movement gaining strength and the election of reformist President Khatami in 1997, the year following Khobar Towers, when some of the best evidence was coming in on the bombing. The Clinton Administration did not appear to want to pick a fight with the Iranians because of hope in Washington (and Riyadh) that an opening with Iran was possible. Much evidence linking Khobar Towers with the Iranians was suppressed within the intelligence community and U.S. government. For quite some time, specific action was taken to deny line analysts, their superior’s access to raw intelligence relating to this issue. Incoming evidence on Khobar Towers became so controversial at the time that we heard that the only person who could see some of the Khobar Towers traffic that was being denied us in the State Department after a certain point was Secretary Albright. I heard she did something very interesting in reaction to this. She reportedly said: “If my experts cannot see this raw intelligence reporting in order to evaluate it properly for me, I don’t want to see it either because I don’t know what it means.” She basically threw it back in their face, challenging them to do what they should: make it much more broadly available so we could do our jobs. Q: Threw it back in whose face? 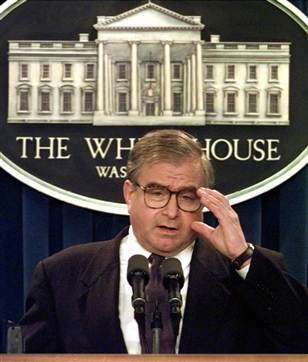 WHITE: Senior people in the Clinton Administration who ordered this unusual step, among which I believe probably was [National Security Advisor] Sandy Berger. There was collateral damage because some of the information that was held back from normal distribution was material that contained other information of use to us in evaluating other developments that we needed for the analysis of other issues pertaining to Saudi Arabia and the Persian Gulf. We heard that if one small portion of an intelligence report related to Khobar Towers, the entire intelligence report was put on restricted distribution. We’ve dealt with things like this before, but it was generally restricted to, say, the INR Front Office. In this instance, the restriction initially went all the way to the top in the Department. It seemed aimed at avoiding pressure from building within the government (and the potential for related a leak) for action against Iran at a time when it was felt at the highest levels that our foreign policy interests concerning Iran might be moving in different direction. I don’t think that is the way to run things. We know about some of this because people in one intelligence agency ordered to severely restrict distribution of reports they were receiving relating to the Khobar Towers bombing along the lines I have described were horrified, and tipped us off under the table about just how upset they were and just how large the body of material not being properly distributed happened to be. And who knows, strong action might not have been a mistaken path. We might have gotten a reaction from the Iranians which was different than the one anticipated. In other words the Iranians, the reformists, might not have simply waved off the evidence as lies and demanded an explanation from their own government. Anyhow, what was done by us turned out to be a losing gamble. What did we get in the end? We got the defeat of the reformists in Iran, no improved relations with Iran, and no payback for the victims of the Khobar Towers bombing…. The Saudis were also alerted. The Saudis actually made some revisions in their protection of the facility, but nobody was ready for this monster of a bomb. They could have done more, and the commander came under criticism for not doing more, particularly in view of the warnings. But, anyway every once in a while you actually can use intelligence, add some real ingenuity, and predict pretty specifically something that is going to happen. And even though the precautions—widening the perimeter somewhat, for example, did not prevent significant damage and loss of life, the results of the bombing would have been even worse without the warnings. Q: Were you picking up that this is essentially an Iranian operation early on? Months after the fact, they [the Saudis], as with, apparently, some senior Clinton Administration officials, did not want any new trouble with Iran. 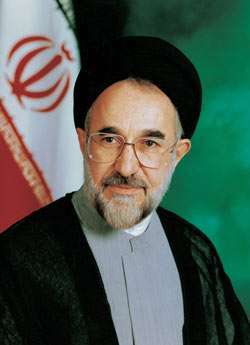 They saw it as an opportunity, this period of reform in Iran that appeared to be succeeding with the election of Khatami in 1997. They wanted to make their peace with the Iranians — see the reformers keep gaining. They knew that accusations and retaliation risked strengthening the Iranian hardliners once again. They probably were putting heat on people like Berger to back off. In fact Berger had a number of one-on-one meetings — I know this from that same source of mine — with Bandar Bin Sultan, the Saudi Ambassador. Those two huddled over this issue repeatedly, seemingly gambling that the reformists, without interference related to Khobar, would prevail continue to make steady gains against the conservatives. And, during 1997-1999, that appeared to be the case. THIBAULT: The suspicion and very strong belief that developed very quickly was that, in one way or the other, the Iranians were behind the Khobar attack, if not the first one. None of this is particularly secret today but at the time it was closely held. Individual names of Iranian operatives surfaced and of course the concern was that the Iranians were perhaps working through the local Shiite community to target Americans. There’s a very strong Shiite presence in the Eastern Province of Saudi Arabia, particularly around the oil fields there, Aramco and the like. The FBI finally managed to open an office in Riyadh and we began developing it, but it took quite a bit of doing and I must say the Ambassador deserves a lot of the credit for being able to push it through — this was (at left) Ambassador [Wyche] Fowler — for being able to bring the Saudis around to cooperation on the investigation. But obviously it was in their interest as well. They saw what a powerful reaction there was in the United States. The whole foundation of the relationship was being questioned. With subsequent attacks in Yemen on the USS Cole and on our embassies in Kenya and Tanzania, with which bin Laden and al Qaeda became identified, the focus shifted to the Sunni versus Shiite dimension of terrorism. In addition to trying to get the Saudis to apply pressure on the Taliban in Afghanistan to take action against bin Laden in Afghanistan, we continued to look more closely at the relationship between the Sunni religious establishment in the kingdom and the royal family…. Q: Wayne White said it became quite clear early on that the Iranians probably were behind this but that the Saudis didn’t want this to come out. And at the same time things were happening in Iran, where we were feeling things were getting more liberal. So the whole thing was an attitude, held both by the United States and by the Saudis, sort of “don’t follow it too close.” Was this your feeling? THIBAULT: Certainly, I think on the part of the Saudis, they were very reluctant to publicly identify the Iranians. I think that the most compelling reason is that they were uncertain what the American reaction would be if evidence became overwhelming and incontrovertible that the Iranians were in fact behind this. And as I say, though the view favoring Iranian responsibility emerged very soon in Washington, I’m not sure there was conclusive, absolutely dead-sure kind of evidence, within a reasonable period of time, that the Iranians were involved. To the extent that the Saudis feared that such evidence might be uncovered, then our reaction would become unpredictable for then. They had their own problems with the Iranians and they were not inclined to roil those waters. So I think that this hesitation or this ambivalence — maybe that’s the better word, ambivalence — created a feeling among many Americans, particularly on the investigative side, that they were not getting full access to the information that the Saudis had. Q: White felt that some punches were being pulled at the NSC, at the top, I guess Sandy Berger, level, because of what was perceived as being a change in Iran. Hope, I guess, springs eternal. THIBAULT: I recall Rafsanjani…had just taken office [as president] and he was viewed as maybe a bit little more liberal. I know the Saudis had great fears of the Iranians, particularly, for example, in their ability to disrupt the hajj. They did it once in 1987, I believe. It took on an anti-American tinge, thousands of Iranian pilgrims hoisting Khomeini placards and shouting slogans in the most sacred precincts of the Grand Mosque, which deeply shocked the Saudis. In fact, there was a clash in Mecca then in which several hundred people were killed. This event, this politicization of the Hajj, was especially troubling because it jeopardized the Saudi reputation for managing a peaceful hajj for all Muslims. Guardianship of the Holy Places is their unshakable claim to legitimacy at home and in the Muslim world. This is an area of real vulnerability for them and they know that the Iranians know they can push that button. 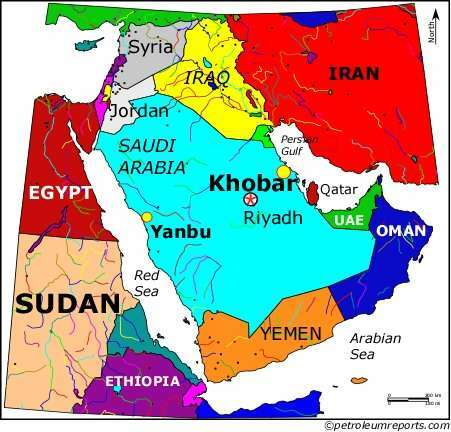 So regarding Khobar, they perhaps handled them in a very gingerly fashion, as they did regarding the Iranian occupation of disputed islands on the coast of Bahrain and the UAE [United Arab Emirates]. The Saudis were quite restrained in commenting publicly on this and in responding to the pressure for a stronger stance that came from some of their Gulf neighbors. So I think that was part of it, yes. 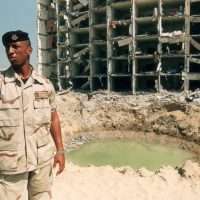 These explosions, and particularly the one at Khobar June 1996, were the turning point, not just for our security posture in Saudi Arabia, but even worldwide for U.S. embassies because it was clear tha t we had an ideological adversary targeting Americans in our most vulnerable locations. To that extent, perhaps, it differed from the attack on the Marines in the early 80s in Beirut, where you might argue it happened in response to the immediate situation at the time. In any event, we immediately redeployed our military missions and presence in Saudi Arabia. We reduced our footprint, as they say. For example, the U.S. military presence at the base in Dhahran was terminated. We consolidated our assets at the Prince Sultan Airbase which is in central Saudi Arabia, south of Riyadh, about 60-70 miles south of Riyadh, where we had not had much infrastructure, in part because it was in the middle of nowhere, therefore more difficult to attack, easier to defend, to isolate. We placed tremendous new constraints on the movement of our military personnel in public, for example, in Riyadh. 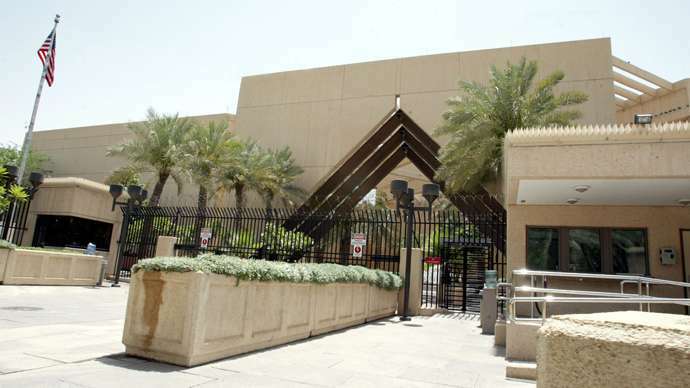 In the embassy (at right; photo: AFP) we took a whole series of measures, which included closing off several streets around the embassy, of course working with the Saudi government on this. And again the Ambassador had to go to the top to get approval for this. The Interior Minister, Prince Nayif, was very reluctant to permit it, regarding it as a challenge to the Saudi obligation to guarantee security. So we closed off several streets, we developed physical barriers, we expanded the open space around the embassy.